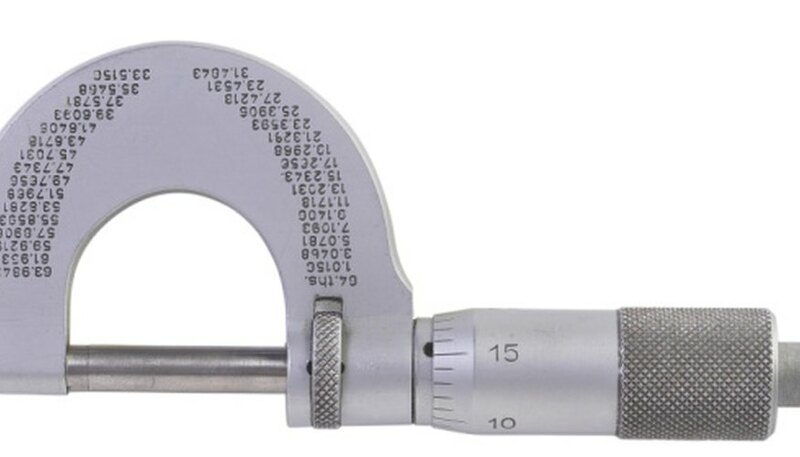 A micrometer is a precision made tool designed for measuring small distances very accurately. They're used in a number of applications such as high tech engineering and computers. Reading a micrometer cannot be made any easier, but with some instruction and guidance, it can be explained so that anybody can proficiently use one. Look at the micrometer and identify all the parts. The sleeve is the part with the scale marked horizontally, the thimble rotates clockwise around the sleeve and has a scale written around it and the ratchet is the rotating part on the bottom which is used to adjust the micrometer. Secure the object for measuring between the spindle and the anvil face and secure by rotating the ratchet. Look at the sleeve to start with. The scale is in millimeters on the top and the lower scale indicates half millimeters. On the top scale look for the last visible number which go up in 5 millimeter steps. Count along from the last visible number on the top scale and see how many extra lines can be seen. For example, if the last number that can be seen is 15 and there are two markers after it still visible the whole number of millimeters is 17. Look at the lower scale on the sleeve and see if a half millimeter marker can be seen. If one is visible, then the object is larger than x.5 millimeters; if not, then it's less than that figure. Take a measurement off the thimble to get the full measurement. The thimble is marked in hundredths of a millimeter. It goes up in multiples of 5 up to 50. Add the thimble measurement to the sleeve measurement. For example, if the sleeve indicates 15.5 millimeters and the thimble is at 33, then the total distance is 15.83 millimeters. Alternatively you can buy a digital micrometer that will take the reading for you. These are more expensive, but eliminate the chances of mistakes. Using a magnifying glass can make reading the scale on the micrometer easier. How to Determine What Morse Taper Is on a Lathe?